Varmint Hunters who hunt with an AR15 have a completely new trigger system coming from Franklin Armory. The RFS (Release Firing System) is a trigger that fires, when the trigger is released. This essentially allows you to have a negative trigger pull, because the trigger is only moving forward. Longer shots on varmints and threading your bullet through some grass (because your only clear shot is the eyeball of a prairie dog at 200 yards) will no longer be subject to how heavy your trigger pull is on your AR. That variable is now removed. In Mode 3, the firearm is not designed to fire on the pull stroke of the trigger. Instead, it is designed to fire when the trigger is released. When it is released, the hammer will fall forward and hit the firing pin. If the shooter were to have an emergency cease fire after pulling the trigger, the RFS will allow the shooter to rotate the selector back to Mode 2 and release the trigger without firing a shot. The selector could then be placed on Safe and unloaded. The RFS will be available in all of Franklin Armory’s VSeries rifles, as well as the F17-L and F17-V4 rifles, which are chambered in 17WSM. RFS equipped firearms are slated to start shipping during the first week of December 2015. The RFS trigger will be also be released as a stand-alone product very soon. The question most hunters will have, is how hard will it be to retrain my brain to release the trigger when I have a target in my crosshairs? We should have one of the RFS triggers arriving soon, which we will be testing thoroughly both at the range, and in the field. We will also have an answer to the question above, from experienced varmint hunters. 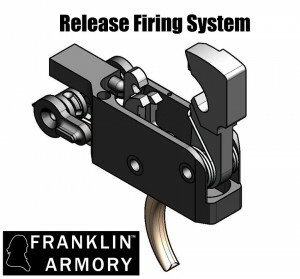 Franklin Armory will also be releasing the Binary Firing System, which will be a great option for folks who want to have a blast while shooting at the range. We should have one of those as well, so stay turned to AR15Hunter.com! AR15 Hunter is a website dedicated to the most versatile hunting platform available today.